Almost everyone will develop a skin tag at some point in their life. A skin tag is a small flap of tissue that hangs off the skin by a connecting stalk. Skin tags are not dangerous. They are usually found on the neck, chest, back, armpits, under the breasts, or in the groin area. Skin tags usually don’t cause any pain. However, they can become irritated if anything, such as clothing or jewellery, rubs on them. 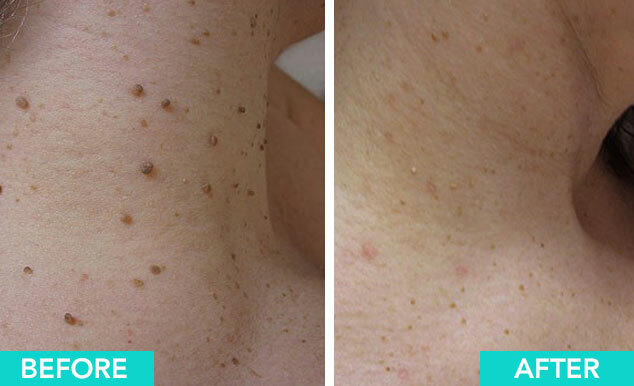 Skin tags are easily removed at Redeem Medispa. We offer an effective and easy skin tag removal treatment, via a cautery system. This will cause the skin tag to burn off and fall off. So come in now to book you skin tag removal treatment and suffer no longer. Skin tags are made of loose collagen fibres and blood vessels surrounded by skin. Collagen is a type of protein found throughout the body. Both men and women can develop skin tags. Come in for a free no obligation assessment to learn more about Skin Tags treatments and if you are the right candidate to receive Skin Tags.